Two projects to increase snowmaking on Aspen Mountain and the Snowmass Ski Area have received initial approvals from the U.S. Forest Service, but any potential effects of drawing more water from the local watershed for the additional snowmaking remain unclear. 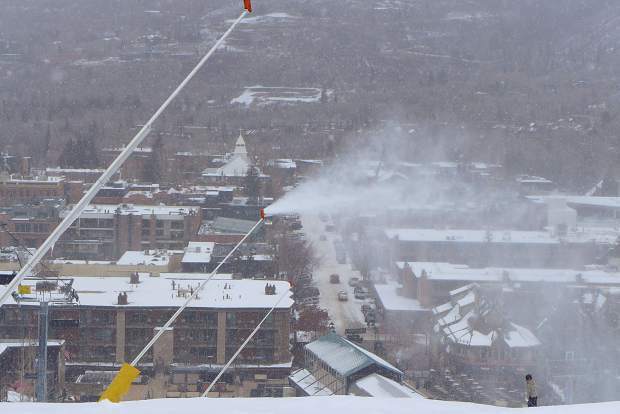 Aspen Skiing Co. is planning to use an additional 82 acre-feet — 26.7 million gallons — of water per season as part of its two snowmaking expansion projects, with most of the water coming out of Castle, Maroon, Snowmass and East Snowmass creeks. Aspen Mountain will use an additional 57 acre-feet of water per season for new snowmaking infrastructure on 53 acres near the summit to create reliable and consistent snow coverage, according to a hydrology report that Glenwood Springs-based Resource Engineering prepared for the U.S. Forest Service. Snowmass will use an additional 25 acre-feet of water per season to cover 33 acres of terrain on the Lodgepole, Lunkerville and Adams Avenue trails, according to an environmental assessment by the Forest Service. The additional 82 acre-feet of water combined from both the Aspen Mountain and Snowmass expansions will be on top of the 821 acre-feet that Skico currently uses on average each season across its four ski areas, bringing the total seasonal average to 903 acre-feet, according to Rich Burkley, Skico’s senior vice president of strategy and business development. To put that much water into perspective, Wildcat Reservoir, visible from the Snowmass Ski Area, holds 1,100 acre-feet of water. Burkley said snowmaking has historically been used to connect natural snowfall to the lifts and base areas. The company’s snowmaking philosophy, he said, is to limit it to the bare minimum needed to open the trails, host events and reach the end of the season. Mountain managers hope increased snowmaking will help avoid a repeat of the bare, rocky slopes of the early 2017-18 season. Although there are fewer other water users pulling from local streams — outdoor irrigation season is over — when Skico fires up its snowmaking operations in November and December, it is using water during a time of year when streamflows are at some of their lowest points of the year. Despite a close read of two recent Forest Service environmental assessments on the snowmaking expansions, it is still not easy to determine exactly what might be the impact of drawing more water from Castle, Maroon, Snowmass and East Snowmass creeks, the four streams that provide most of the water for snowmaking at Skico’s four ski areas. In June, Pitkin County submitted to the Forest Service a comment encouraging the agency to consider the impacts of increased snowmaking on stream health and the overall watershed, including the potential violation of state minimum instream-flow requirements on Castle and Maroon creeks. Roger Poirier, mountain-sports program manager for the White River National Forest, said that the Forest Service adequately addressed the county’s concerns in its environmental assessment of the project. “Ultimately, we’ve found that the range of change for peak flows and watershed yields associated with the snowmaking SkiCo is proposing are within the natural annual variability of water yield and peak flow,” he said. The Forest Service issued a draft decision notice approving the Aspen Mountain project Nov. 28 and the Snowmass project Dec. 17. Both reviews were in the form of “environmental assessments,” and both projects are currently in their respective 45-day objection period. 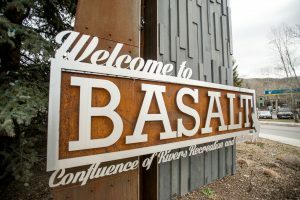 But those assurances from the Forest Service may not be enough for some local river advocates, especially after a hot, dry year that saw some streamflows in the Roaring Fork basin plummet to all-time lows and the city of Aspen implement Stage 2 water restrictions for the first time in history. 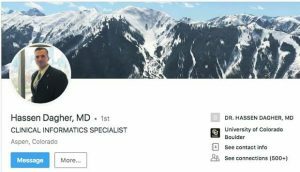 Ken Neubecker, associate director of American Rivers’ Colorado Basin Program and a member of the Pitkin County Healthy Rivers Board, has concerns about taking more water out of the streams in winter. Although most of the snowpack makes it back into the river as spring runoff, that doesn’t help the winter aquatic environment, he said. Also, while snowmaking may not require as much water as other consumptive uses such as irrigation, those relatively small depletions add up. Kate Hudson, a Pitkin County resident and professional environmental advocate focused on water, agrees. Hudson, who is also a member of the county’s streams board, said that because the two projects are being considered separately, it’s hard to measure what the overall impacts might be to the Roaring Fork watershed. The Forest Service review did consider the total depletions of water in the Roaring Fork River watershed from the additional snowmaking, but found they were anticipated, and covered by, an environmental review previously conducted by the U.S. Fish and Wildlife Service on potential future diversions upstream of a key reach of the Colorado River near Grand Junction. The Roaring Fork flows into the Colorado in Glenwood Springs. Aspen Mountain began making snow this season Nov. 1. Its primary snowmaking pump station, located at the base of the mountain, draws water from the city of Aspen’s treated municipal supply, which originates in Castle and Maroon creeks. According to Burkley, Aspen Mountain uses an average of 199 acre-feet of water per season for snowmaking. The new project would add about 57 acre-feet of diversions each season, for a total of 256 acre-feet, or 83 million gallons used for snowmaking on Aspen Mountain, according to figures supplied by Burkley. In terms of overall impact, it’s important to note that not all of the water used for snowmaking is taken out of the watershed permanently. The snow acts as an on-mountain, frozen reservoir. According to the hydrology report, about 74 percent of Aspen Mountain’s water used for snowmaking makes it back into the Roaring Fork River as spring runoff. The other 26 percent is lost to evaporation or sublimation or is sucked up by thirsty plants. The environmental assessment from the Forest Service also warns about instream flows, which are water rights owned by the Colorado Water Conservation Board, and are designed to keep water in the river to preserve natural ecosystems and fish health. The conservation board has 12 cfs of instream flow rights on the segment of Castle Creek where the City of Aspen’s diversion is located. The conservation board has 14 cfs of instream flow rights downstream from the city’s diversion on Maroon Creek. Although streamflows in Maroon and Castle creeks are predicted to more than satisfy the three demands — snowmaking, municipal uses and instream flows — the study warns that snowmaking shortages are possible during drought conditions in the peak snowmaking month of December. 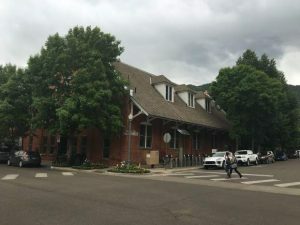 According to Margaret Medellin, utilities portfolio manager for the city of Aspen, the city will not divert if instream flows are threatened. The city has sensors on both its Maroon and Castle Creek headgates and employees manage them daily to preserve the minimum instream flows. For example, Medellin said the city shut down the Maroon Creek hydro facility last summer to protect the instream flows. Streamflows, however, can be hard to verify. There is no public gauge on Castle Creek, and although there is a new U.S. Geological Survey gauge on Maroon Creek, the reading simply said “Ice” for several days in late December. Snowmass currently uses an average of 383 acre-feet of water per season for snowmaking from the Snowmass Creek watershed. The water is provided to Skico by the Snowmass Water and Sanitation District, which serves all of Snowmass Village and the ski area. 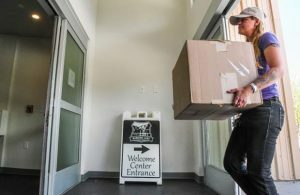 The district both diverts water from East Snowmass Creek, and also pumps water up from Snowmass Creek, to fill Zeigler Reservoir, which holds 252 acre-feet of water, according district manager to Kit Hamby. The water is then sent to the ski area’s snowmaking system when it’s time to make snow. The reservoir, home to “Snomastadon,” was put into service in 2013 and provides a buffer from direct drawdowns from Snowmass Creek, where the conservation board also holds an instream flow right. The ski area also uses another 46 acre-feet from a few ponds that start the season naturally charged. 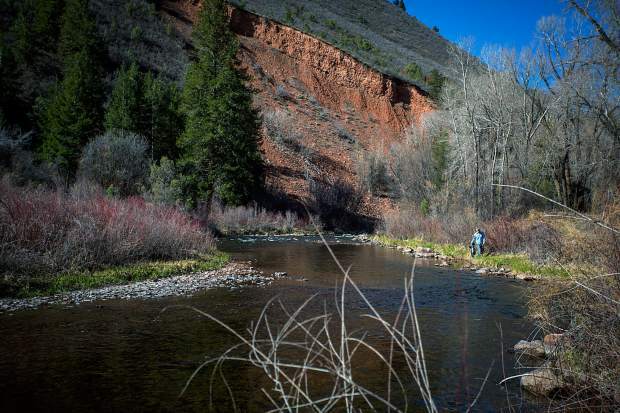 Each season, the new project would draw an additional 25 acre-feet, or 8 million gallons, from the Snowmass Creek watershed. As for Skico’s other two ski areas, Aspen Highlands 55 acre-feet a season on average from the city of Aspen’s municipal supply and Buttermilk uses an average of 184 acre-feet a season from Maroon Creek, according to Burkley. Including the new projects, the total seasonal-average use on all four mountains for snowmaking is expected to be 903 acre-feet of water. Skico works hard to remain an industry leader in sustainability and the environment. Its “Give a Flake” campaign encourages skiers to take action on climate change. Burkley admits any expansion of terrain or snowmaking contradicts the company’s sustainability message, but he adds that snowmaking is necessary. And last season’s dry and warm conditions brought to the forefront how crucial it is to have snowmaking at higher elevations. Editor’s note: Aspen Journalism is covering rivers and water with The Aspen Times. More at http://www.aspenjournalism.org.